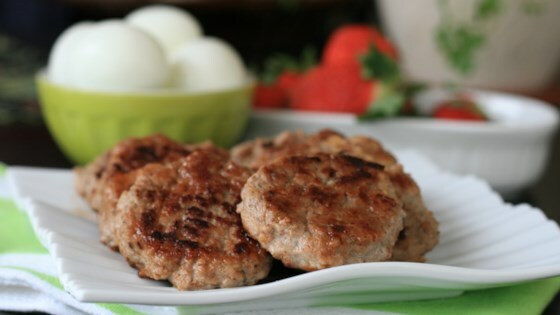 "I love breakfast sausage, but most store-bought brands are high in calories and fat and not very diet-friendly. Try this slightly sweet version made with real maple syrup. The apples help keep the sausage moist. I like to cook up a batch on Sundays and store in the fridge for quick breakfasts all week. Take care not to overcook the patties." Combine turkey, apple, maple syrup, salt, sage, garlic powder, black pepper, marjoram, cinnamon, and cloves in a bowl; mix well. Form into 10 small patties. Heat olive oil in a skillet over medium heat. Fry patties until no longer pink in the center and the juices run clear, 3 to 4 minutes per side. An instant-read thermometer inserted into the center should read at least 165 degrees F (74 degrees C). This was a nope for me. Ground turkey is processed with so much water these fell apart in the skillet. It tasted like boiled meat with spice fruit..